One of the questions we are being constantly asked is whether intranasal light therapy will work for asthma or other respiratory related conditions including allergies. At one of San Francisco trade shows that we have attended recently we witnessed several cases when just one intranasal light therapy session would alleviate breathing difficulties. Judging by accompanying symptoms of nasal congestion and sinusitis, I would assume that they were cases of bronchial asthma as opposed to a differnt kind of breathing difficulty associated with emphysema relating to the alveoli or air sacs. As far as one can observe this method, even being anecdotal, is a therapy that works for asthma. Some of our friends have been using this device for several years and throughout all these years of regular intranasal device use they haven't experienced a single asthma attack. To answer this question in details we have put together a webpage that provides a scientific basis and evidence as to why intranasal light therapy works for asthma. These pieces of evidence have mainly been compiled by Russian scientists who used the older form of blood irradiation i.e. intravenous blood irradiation. It pretty much cures asthma as far as their patient group goes. Those who have been reading our articles know by now that the outcomes from the older method and our newer intranasal light therapy are very much the same. What matters the most in this case, as usual, is the underlying mechanism behind the therapy's efficacy. The information on the webpage should be clear with the following short explanation. 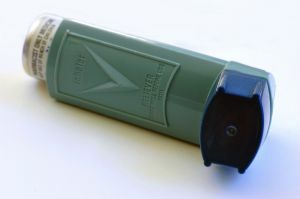 Asthma is caused by our own body's overreacting to an allergen. A 'cascading' biochemical series of events is initiated when our T cells start to rapidly stimulate B cells. Then subsequent reactions lead to an over-production of histamines that in its turn causes breathing difficulties. The excessive activities of T lymphocyte cells, triggered by T-helper cells, should be counteracted by T-suppressor cells to maintain a balance in order to avoid overreaction. It is this imbalance that leads to asphyxia or lack of oxygen that is identified with asthma. A group of researchers have found that when the chest is exposed to irradiation by near infrared red light this balance is achieved, and asthmatic conditions get alleviated quite significantly after just two weeks of regular treatment. As we already know, intranasal light therapy helps establish cellular balance i.e. homeostasis, which also in some way explains the connection to the suggested therapeutic mechanism. As it was proposed by another study, it also works because of the rebalancing of oxidants and antioxidants levels in the system - something that intranasal light therapy has proved to stimulate. Read more on this webpage.